The word dēnārius is derived from the Latin dēnī "containing ten", as its value was originally of 10 assēs. [note 1] The word for "money" descends from it in Italian (denaro), Slovene (denar), Portuguese (dinheiro), and Spanish (dinero). Its name also survives in the dinar currency. Its symbol is represented in Unicode as 𐆖 (U+10196), however it can also be represented as X̶ (capital letter X with combining long stroke overlay). Starting with Nero in AD 64, the Romans continuously debased their silver coins until, by the end of the 3rd century AD, hardly any silver was left. A predecessor of the denarius was first struck in 267 BC, five years before the First Punic War, with an average weight of 6.81 grams, or ​1⁄48 of a Roman pound. Contact with the Greeks prompted a need for silver coinage in addition to the bronze currency that the Romans were using at that time. The predecessor of the denarius was a Greek-styled silver coin called the didrachm which was struck in Neapolis and other Greek cities in southern Italy. These coins were inscribed for Rome but closely resemble their Greek counterparts. They were most likely used for trade purposes and were seldom used in Rome. The first distinctively Roman silver coin appeared around 226 BC. Classic historians sometimes called these coins denarii, but they are classified by modern numismatists as quadrigati, which is derived from the quadriga, or four-horse chariot, on the reverse, and which with a two-horse chariot or biga was the prototype for the most common designs used on Roman silver coins for the next 150 years. Rome overhauled its coinage around 211 BC and introduced the denarius alongside a short-lived denomination called the victoriatus. This denarius contained an average 4.5 grams, or ​1⁄72 of a Roman pound, of silver. It formed the backbone of Roman currency throughout the Roman republic. The denarius began to undergo slow debasement toward the end of the republican period. Under the rule of Augustus (31 BC-AD 14) its silver content fell to 3.9 grams (a theoretical weight of ​1⁄84 of a Roman pound). It remained at nearly this weight until the time of Nero (AD 37–68), when it was reduced to ​1⁄96 of a pound, or 3.4 grams. Debasement of the coin's silver content continued after Nero. Later Roman emperors reduced its content to 3 grams around the late 3rd century. The value at its introduction was 10 asses, giving the denarius its name, which translates as "containing ten". In about 141 BC, it was re-tariffed at 16 asses, to reflect the decrease in weight of the as. The denarius continued to be the main coin of the Roman Empire until it was replaced by the antoninianus in the middle of the 3rd century. The coin was last issued, in bronze, under Aurelian between AD 270 and 275, and in the first years of the reign of Diocletian. ('Denarius', in A Dictionary of Ancient Roman Coins, by John R. Melville-Jones (1990)). 267 Predecessor 6.81g ? 1/48 pound. Equals 10 asses, giving the denarius its name, which translates as "containing ten". The original copper coinage was weight-based, and was related to the Roman pound, the libra, which was about 325 g. The basic copper coin, the as, was to weigh 1 Roman pound. This was a large cast coin, and subdivisions of the as were used. The "pound" (libra etc) continued to be used as a currency unit, and survives e.g. in the British monetary system, which still uses the pound, abbreviated as £. 211 Introduction 4.55g 95–98% 1/72 pound. Denarius first struck. According to Pliny, it was established that the denarius should be given in exchange for ten pounds of bronze, the quinarius for five pounds, and the sestertius for two-and-a-half. But when the as was reduced in weight to one ounce, the denarius became equivalent to 16 asses, the quinarius to eight, and the sestertius to four; although they retained their original names. It also appears, from Pliny and other writers, that the ancient libra was equivalent to 84 denarii. 200 Debasement 3.9g 95–98% 1/84 pound. 141 Debasement 3.9g 95–98% 1/84 pound. Retariffed to equal 16 asses due to the decrease in weight of the as. 44BC Debasement 3.9g 95–98% Death of Julius Caesar, who set the denarius at 3.9g. Legionary (professional soldier) pay was doubled to 225 denarii per year. 14–37 3.9g 97.5–98% Tiberius slightly improved the fineness as he gathered his infamous hoard of 675 million denarii. 64–68 Debasement 3.41g 93.5% 1/96 pound. This more closely matched the Greek drachm. In 64, Nero reduced the standard of the aureus to 45 to the Roman pound (7.2 g) and of the denarius to 96 to the Roman pound (3.30 g). He also lowered the denarius to 94.5% fine. Successive emperors lowered the fineness of the denarius; in 180 Commodus reduced its weight by one-eighth to 108 to the pound. 193–235 Debasement 3.41g 83.5% Several emperors (193–235) steadily debased the denarius from a standard of 78.5% to 50% fine. In 212 Caracalla reduced the weight of the aureus from 45 to 50 to the Roman pound. They also coined the aes from a bronze alloy with a heavy lead admixture, and discontinued fractional denominations below the as. In 215 Caracalla introduced the antoninianus (5.1 g; 52% fine), a double denarius, containing 80% of the silver of two denarii. The coin invariably carried the radiate imperial portrait. Elagabalus demonetized the coin in 219, but the senatorial emperors Pupienus and Balbinus in 238 revived the antoninianus as the principal silver denomination which successive emperors reduced to a miserable[clarification needed] billon coin (2.60 g; 2% fine). 274 Double Denarius 3.41g 5% In 274, the emperor Aurelian reformed the currency and his denominations remained in use until the great recoinage of Diocletian in 293. Aurelian struck a radiate aurelianianus of increased weight (84 to the Roman pound) and fineness (5% fine) that was tariffed at five notational[clarification needed] denarii (sometimes called "common denarii" or "denarii communes" by modern writers, although this phrase does not appear in any ancient text). The coin carried on the reverse the numerals XXI, or in Greek κα (both meaning 21 or 20:1). Some scholars believe that this shows that the coin was equal to 20 sestertii[clarification needed] (or 5 denarii), but it is more likely that it was intended to guarantee that it contained 1/20 or 5% of silver, and was thus slightly better than many of the coins in circulation. The aureus (minted at 50 or 60 to the Roman pound) was exchanged at rates of 600 to 1,000 denarii, equivalent to 120 to 200 aurelianiani. Rare fractions of billion[clarification needed] denarii, and of bronze sestertii and asses, were also coined. At the same time, Aurelian reorganized the provincial mint at Alexandria, and he minted an improved Alexandrine tetradrachmon that might[clarification needed] have been tariffed at par with the aurelianianus. The emperor Tacitus in 276 briefly doubled the silver content of the aurelianianus and halved its tariffing[clarification needed] to 2.5 d.c. (hence[clarification needed] coins of Antioch and Tripolis (in Phoenicia) carry the value marks X.I), but Probus (276–282) immediately returned the aurelianianus to the standard and tariffing[clarification needed] of Aurelian, and was the official tariffing until the reform of Diocletian in 293. 735 Novus denarius (new penny) Pepin the Short (r. 751–768), the first king of the Carolingian dynasty and father of Charlemagne, minted the novus denarius ("new penny"): 240 pennies minted from one Carolingian pound. So a single coin contained 21 grains of silver. Around 755, Pepin's Carolingian Reform established the European monetary system, which can be expressed as: 1 pound = 20 shillings = 240 pennies. Originally the pound was a weight of silver rather than a coin, and from a pound of pure silver 240 pennies were struck. The Carolingian Reform restored the silver content of the penny that was already in circulation and was the direct descendant of the Roman denarius. The shilling was equivalent to the solidus, the money of account that prevailed in Europe before the Carolingian Reform; it originated from the Byzantine gold coin that was the foundation of the international monetary system for more than 500 years. Debts contracted before the Reform were defined in solidi. For three centuries following the reform, the only coin minted in Europe was the silver penny. Shillings and pounds were units of account used for convenience to express large numbers of pence, not actual coins. The reform also reduced the number of mints, strengthened royal authority over the mints, and provided for uniform design of coins. All coins bore the ruler's name, initial, or title, signifying royal sanction of the quality of the coins. Charlemagne spread the Carolingian system throughout Western Europe. The Italian lira and the French livre were derived from the Latin word for pound. Until the French Revolution, the unit of account in France was the livre, which equalled 20 sols or sous, each of which in turn equaled 12 deniers. During the Revolution the franc replaced the livre, and Napoleon's conquest spread the franc to Switzerland and Belgium. The Italian unit of account remained the lira, and in Britain the pound-shilling-penny relationship survived until 1971. Even in England the pennies were eventually debased, leaving 240 pennies representing substantially less than a pound of silver, and the pound as a monetary unit became divorced from a pound weight of silver. After the breakup of the Carolingian Empire pennies debased much faster, particularly in Mediterranean Europe, and in 1172 Genoa began minting a silver coin equal to four pennies. Rome, Florence, and Venice followed with coins of denominations greater than a penny, and late in the 12th century Venice minted a silver coin equal to 24 pennies. By the mid-13th century Florence and Genoa were minting gold coins, effectively ending the reign of the silver penny (denier, denarius) as the only circulating coin in Europe. 757–796 Penny Offa, king of Mercia, minted and introduced to England a penny of 22.5 grains of silver. The coin's designated value, however, was that of 24 troy grains of silver (one pennyweight, or 1/240 of a troy pound, or about 1.56 grams), with the difference being a premium attached by virtue of the minting into coins (seigniorage). The penny led to the term "penny weight". 240 actual pennies (22.5 grains; minus the 1.5 grain for the seigniorage) weighed only 5400 troy grains, known as a Saxon pound and later known as the tower pound, a unit used only by mints. The tower pound was abolished in the 16th century. However, 240 pennyweights (24 grains) made one troy pound of silver in weight, and the monetary value of 240 pennies also became known as a "pound". The silver penny remained the primary unit of coinage for about 500 years. 790 Penny 1.76g 95–96% Charlemagne new penny with smaller diameter but greater weight. Average weight of 1.7 g, but ideal theoretical[clarification needed] mass of 1.76 g. Purity is from 95% to 96%. 1527 ? Penny 1.58g 99% Tower pound of 5400 grains abolished and replaced by the Troy pound of 5760 grains. 1158 Penny 92.5% The purity of 92.5% silver (i.e. sterling silver) was instituted by Henry II in 1158 with the "Tealby Penny" — a hammered coin. 1500s Penny By the 16th century it contained about a third the silver content of a Troy pennyweight of 24 grains. 1915 Penny A penny was worth around one-sixth of its value during the Middle Ages. British government sources suggest that prices have risen over 61-fold since 1914. Marco Sergio Silo: 116-5 a.C. It is difficult to give even rough comparative values for money from before the 20th century, as the range of products and services available for purchase was so different. Classical historians often say that in the late Roman Republic and early Roman Empire (~27 BC) the daily wage for an unskilled laborer and common soldier was 1 denarius (with no tax deductions) or about US$2.80 in bread. During the republic (509–27 BC),[when?] legionary pay was 112.5 denarii per year (0.3 per day), later doubled by Julius Caesar to 225 denarii (0.6 per day), with soldiers having to pay for their own food and arms. Centurions received considerably higher pay: under Augustus, the lowest rank of centurion was paid 3,750 denarii per year, and the highest rank, 15,000 denarii. The silver content of the denarius under the Roman Empire (after Nero) was about 50 grains, 3.24 grams, or ​1⁄10 (0.105ozt) troy ounce. On June 6, 2011, this was about US$3.62 in value if the silver were 0.999 pure. The fineness of the silver content varied with political and economic circumstances. From a purity of greater than 90% silver in the 1st century AD, the denarius fell to under 60% purity by the year 200, and plummeted to 5% purity by the year 300. By the reign of Gallienus, the antoninianus was a copper coin with a thin silver wash.
By comparison, a laborer earning the minimum wage in the United States in January 2014 made US$58 for an 8-hour day, before taxes (based on the mode value of $7.25 per hour, which was true[clarification needed] then in 20 states) and an employee earning the minimum wage in the United Kingdom in 2014 made £52 for an 8-hour day, before taxes. In the final years of the 1st century BC Tincomarus, a local ruler in southern Britain, started issuing coins that appear to have been made from melted down denarii. The coins of Eppillus, issued around Calleva Atrebatum around the same time, appear to have derived design elements from various denarii such as those of Augustus and M. Volteius. Even after the denarius was no longer regularly issued, it continued to be used as a unit of account, and the name was applied to later Roman coins in a way that is not understood. The Arabs who conquered large parts of the land that once belonged to the Eastern Roman Empire issued their own gold dinar. The lasting legacy of the denarius can be seen in the use of "d" as the abbreviation for the British penny until 1971. It also survived in France as the name of a coin, the denier. The denarius also survives in the common Arabic name for a currency unit, the dinar used from pre-Islamic times, and still used in several modern Arab nations. The major currency unit in former Principality of Serbia, Kingdom of Serbia and former Yugoslavia was dinar, and it is still used in present-day Serbia. The Macedonian currency denar is also derived from the Roman denarius. 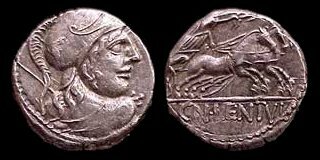 The Italian word denaro, the Spanish word dinero, the Portuguese word dinheiro, and the Slovene word denar, all meaning money, are also derived from Latin denarius. In the New Testament, the gospels refer to the denarius as a day's wage for a common laborer (Matthew 20:2, John 12:5). In the Book of Revelation, during the Third Seal: Black Horse, a choinix (or quart) of wheat and three quarts of barley were each valued at one denarius. Bible scholar Robert H. Mounce says the price of the wheat and barley as described in the vision appears to be ten to twelve times their normal cost in ancient times. Revelation describes a condition where basic goods are sold at greatly inflated prices. Thus, the black horse rider depicts times of deep scarcity or famine but not of starvation. The English word "quart" translates "choinix". Apparently, a choinix of wheat was the daily ration of one adult. Thus, in the conditions pictured by Revelation 6 the normal income for a working-class family would buy enough food for only one person. The less costly barley would feed three people for one day's wages. The denarius is also mentioned in the Parable of the Good Samaritan (Luke 10:25–37). The Render unto Caesar passage in Matthew 22:15–22 and Mark 12:13–17 uses the word δηνάριον to describe the coin held up by Jesus, translated in the King James Bible as "tribute penny". It is commonly thought to be a denarius with the head of Tiberius. ^ Its value was increased to 16 assēs in the middle of the 2nd century BC. ^ David. L. Vagi. Coinage and History of the Roman Empire, c. 82 BC- AD 480. II. Sydney, Ohio: Coin World. ^ Metcalf, William E. (2012). The Oxford Handbook of Greek and Roman Coinage. 198 Madison Avenue, New York, NY 10016: Oxford University Press. p. 300. ISBN 978-0-19-937218-8. ^ Handbook to Life in Ancient Rome, Lesley Adkins and Roy A. Adkins. Oxford University Press, New York 1994. ^ "Aurelian, Roman Imperial Coinage reference, Thumbnail Index". Wildwinds.com. Retrieved 24 August 2006. ^ "Aurelian Æ Denarius. Rome mint. IMP AVRELIANVS AVG, laureate, draped & cuirassed bust right". Wildwinds.com. Archived from the original on 12 June 2006. Retrieved 24 August 2006. ^ Katsari, Constantina (2002). "The Concept of Inflation in the Roman Empire". Retrieved 2006-12-06. ^ "United States Department of Labor—Wage and Hour Division (WHD)". www.dol.gov. Retrieved 10 January 2014. ^ "National Minimum Wage rates". www.gov.uk. Retrieved 14 November 2014. ^ a b De Jersey, Philip (1996). Celtic Coinage in Britain. Shire Publications. pp. 29–30. ISBN 0-7478-0325-0. ^ Bean, Simon C (1994). "The coinage of Eppilus". The coinage of Atrebates and Regni (PDF) (Ph.D.). University of Nottingham. pp. 341–347. Retrieved 14 July 2016. ^ "Matthew 20:2 NIV – He agreed to pay them a denarius". Bible Gateway. Retrieved 2013-10-02. ^ "Jn 12:5; NIV – "Why wasn't this perfume sold ..." Bible Gateway. Retrieved 2013-10-02. The as, occasionally assarius was a bronze, and later copper, coin used during the Roman Republic and Roman Empire. The sestertius, or sesterce, was an ancient Roman coin. During the Roman Republic it was a small, silver coin issued only on rare occasions. During the Roman Empire it was a large brass coin. The dupondius was a brass coin used during the Roman Empire and Roman Republic valued at 2 asses. The quinarius was a small silver Roman coin valued at half a denarius. The quadrigatus was a medium-sized silver coin produced by the Roman Republic during the 3rd century BC. The obverse featured a young janiform bust and the reverse featured Victory driving a quadriga, giving the coin its name, with the inscription "ROMA" below. The Edict on Maximum Prices was issued in 301 by Roman Emperor Diocletian. A Zuz was an ancient Jewish silver coin struck during the Bar Kochba revolt, as well as a Jewish name for the various types of non-Jewish small silver coinage, used before and after the period of the revolt. The name was used from the Greek era of drachmas, through the Roman era of Denarius, and then as the quarter denomination of Bar Kochba coinage. The Jewish insurrectionists' zuz were overstruck on Roman Imperial denarii or Roman provincial drachmas of Vespasian, Titus, Domitian, Trajan and Hadrian. Four Zuz, denarii or drachmas make a Shekel, a Sela or a Tetradrachm. In the currency of ancient Rome, the bigatus is a type of denarius stamped on the reverse with a biga, a two-horse chariot. It began to appear in the first decade of the 2nd century BC as an alternative to the victoriatus, and most numismatists believe that it was not used before 190 BC. A denarius with a four-horse chariot (quadriga) had already been in use for some time; see quadrigatus, likewise named for its chariot icon and depicting in addition the Dioscuri.